That’s all for 2010. See you in 2011. Satire is dead… This takes irony to a whole new level… etc, etc. The people who decide these things either inhabit a parallel universe or hold us in undisguised contempt. You decide which. 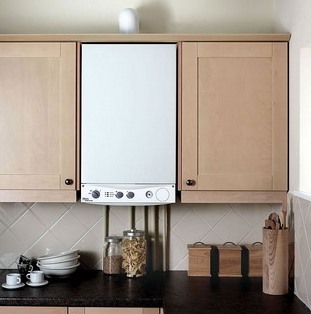 Following a 5 Star Blogging link to American Thinker yesterday and other comments around the UK end of the blogosphere, a storm is brewing about the previous government’s promotion of condensing boilers. 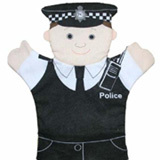 ‘… this equipment was foisted on the unsuspecting public in 2005 by John Prescott, then deputy prime minister. It was done through the expedient of amending the thermal efficiency requirements for domestic heating appliances in the Building Regulations. CO2 emissions and climate change were all that mattered to the government, while no consideration was given to the propensity of the boilers to freeze in winter weather, sometimes putting the boiler beyond economic repair. The outcome is an example of what happens when airy fairy beliefs in flawed hypotheses clash with the real world and the consequences, as always, fall upon the poor bloody consumer. 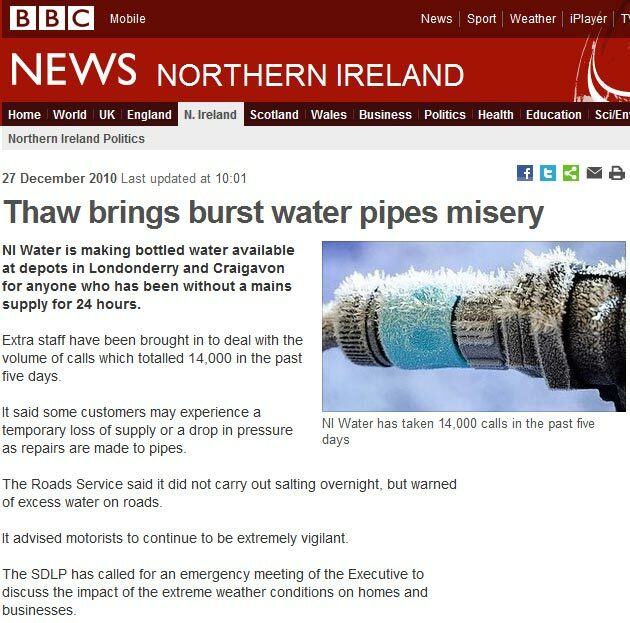 As North says, everyone who has had a boiler failure for this reason over the last cold period, has a valid claim against government, for the costs of the call-out and remedial action, and for consequential losses. This one has some legs in it yet. The ‘party line’ is the order of the day for the EU in 2011. Stephen Fidler, writing in the Wall Street Journal, explains that at the top of the European leaders’ new year resolutions is ‘promising to stay on message’. In other words, leaders and officials are being told to shut up and only sing from the Brussels approved hymnal. It is a recipe for deceit that will widen the gulf between the political elite and the people they are determined hide the truth from. It used to be quite common for politicians to say one thing to audiences at home and something quite different abroad. The Brazilians have a saying for it: só para inglês ver. It literally means “Only for the English to see” but it’s used to describe things said or done for show where the underlying reality is quite different. It is said to have derived from the 19th century when the British were clamping down on the slave trade, and the Brazilian government (which did not abolish slavery until 1888) pretended to be helping them. In the example, the role of latter day Brazilians will be played by the EU and the deceived English will be played by the ordinary people of the member states, who be told the party line rather than the truth. This is not about better communication, it is about controlling the flow of information to keep people in the dark. We will only hear what Brussels wants us to hear. It is an abuse of power by the political elite in its determination to avoid being held to account or accept the wishes of the people. It is neither democratic nor acceptable. But this is what will come to pass unless people wake up and resist what amounts to a concerted effort to enslave us within a new bureaucratic order over which we will have no control. Update: Witterings From Witney weighs in, observing that the Heads of Member States are just confirming that they are no longer in charge of their country’s destiny. Welcome to the blogosphere ‘HauntingTheLibrary‘. Although only a few days old, this new blog is already attracting good traffic as it reminds us of the many headline grabbing prophecies of the warmists that have failed to materialise and/or are now being shamelessly contradicted. If you’ve not already paid a visit to HTL it is well worth doing so, along with adding the blog to your roll and its RSS feed to your reader. As 2010 draws to a close we have a late entry for an award in the media’s Unthinking Sycophancy category. Step forward The Scotsman with a short puff piece in praise of the European Regional Development Fund (ERDF). MORE than £6.6 million from the European Regional Development Fund (ERDF) is to be shared by seven projects to help Scots set up their own businesses. Up to 7,000 jobs could be created through the schemes, the Scottish Government claimed. Liz Cameron, chief executive of the Scottish Chambers of Commerce (SCC), praised the latest round of cash awards from the ERDF as “fantastic news for businesses all over Scotland”. I’m sure readers across the UK will join me in expressing unreserved gratitude to the EU, for sending back a small proportion of the money we have had taken from us by Brussels without any democratic mandate, and using these crumbs from its table as propaganda to promote the EU as some kind of generous benefactor rushing to support the UK in a time of need. Perhaps The Scotsman would better serve its readers by explaining where this money originated and telling them how we pay in more than we get back, while a chunk of our cash is used to pay the administration costs of this monetary merry-go-round. But then it wouldn’t sound like quite the great deal the EU want people to think it is. There is a word to describe this Scotsman piece. It is ‘propaganda’. 3. HauntingTheLibrary on Will Someone Tell Monbiot? 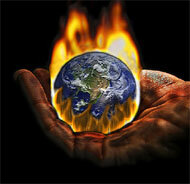 Some people are confused by the media reports and alarmism about carbon dioxide, or CO2. They are left with the impression that CO2 is suffocating the earth and acting like a thick blanket warming the planet. So here’s some simple information about CO2 for those who want some basic facts. Please share it around. As we can see in the diagram below (taken from the ARIC Atmosphere, Climate & Environment Information Programme website a DEFRA endorsed teaching resource for Key Stage 4 and A-Level students in the UK) the sources of carbon dioxide show that 95% of CO2 occurs naturally. There is nothing we can do about it. Only roughly 5% is produced as a result of man’s activity. We know that for every 1,000,000 (one million) parts of atmosphere, around 385 are CO2 and this figure has increased as a result of CO2 being released from the oceans as they get warmer. The rest is made up of other gases and vapours. 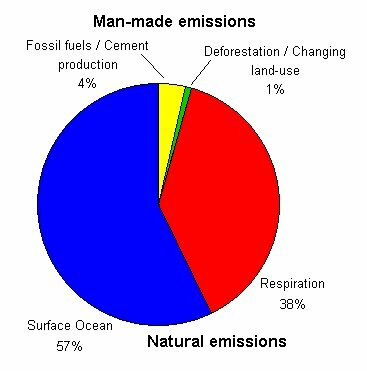 So based on the diagram below, anthropogenic (man made) CO2 emissions add up to just 19 parts per million parts of atmosphere. Are we really to believe that the world faces catastrophe as a result of man being responsible for the existence of 0.0019% of a naturally occuring gas in the atmosphere, but that we can stave off disaster if we reduce that contribution to 0.0007%? Why are politicians not asking themselves questions like this before rushing to regulate and tax our behaviour? Could it be because this helps them to further another agenda? Let’s look at the volume of CO2 in the atmosphere and man’s contribution in a graphical manner. Take the image below (it is quite a large file size). It consists of 1 million dots, each one representing a particle of atmosphere. Download it and increase its size until you can see the colouration in the top left corner. The green dots are naturally occuring CO2, the red dots (barely perceptible unless the image is fully enlarged) are human produced CO2 and the black dots are other gases and vapours. Now think about the CO2 industry that has sprung up and all the billions of dollars, pounds, euros, etc that are being spent to reduce the volume of CO2 in the atmosphere by a trifling 10 or so parts per million. A mere ten or so dots in this image. Yet we are supposed to believe this will make a difference in global temperature of 2C or more, prevent drought, flooding, hurricanes, melting glaciers, receding rainforests and so on. Is it any wonder so many people are not buying the global warming narrative any more? 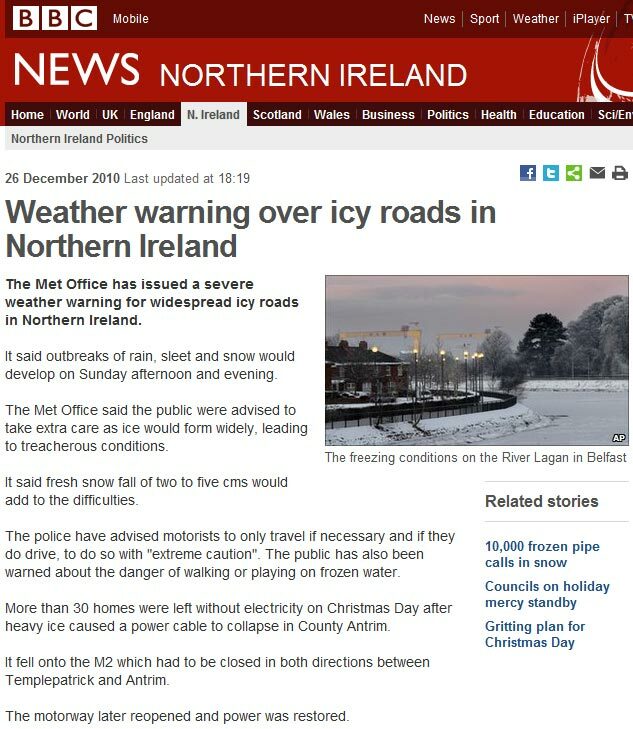 Following the last three bitterly cold winters is it any wonder trust in these people is evaporating as they – the warmists who predicted for years warmer and wetter winters were a sign of CO2 induced global warming – now say the opposite and claim that, actually, colder and more icy winters are evidence of warming? By way of reinforcing the extent of anthropogenic emissions and putting this into context with the atmosphere, this short video is a valuable aid. I do not vote for the party that produced it, but the message is nonetheless important to understand (with thanks to ‘right writes’ in the comments). Two countries, half a world apart, but united by a common problem that will result in spiralling prices for goods, services and energy. The money making scam that has created a market for CO2, despite the fact that there is no proof CO2 is causing any change to climate, is starting to bite. The next stage in the world’s CO2 emissions-trading scheme will begin in two years. Everyone agrees that the rulebook is complicated and that the costs for industry will be enormous. But nobody knows if the system will really help the environment — or merely create a burdensome bureaucracy. The piece also includes some observations from its default left/green perspective about the transformation of CO2 into a new world currency – argued by many to be the objective of the big corporates and investors that would benefit from it at the expense of consumers. … plan for cleaner power stations repeats mistakes made in the US, where a crackdown on emissions from new power stations has deterred investors from building them and led to greater use of coal-fired plants that are, on average, 44 years old. Money, business, investment, regulation… Where in all this is the laser like focus on the environment that is supposed to arrest man’s alleged ruination of the climate? The masks always slip when the real drivers behind these schemes cannot be concealed behind green rhetoric. It really is the silly season. This one will result in much gnashing of teeth. With a large hat tip to Witterings From Witney, who asks some pertinent questions about this story that are well worth reading, the Police blog of Inspector Gadget has revealed the latest advisory issued to our crimefighters. ‘In another nonsensical, empire-building, silly, frothy, pathetic and downright insulting example of political correctness gone mad, we at Ruralshire Constabulary have been told not to use the term “as sure as eggs are eggs”. Apparently this may upset any women listening, especially those who may suffer from fertility problems. This is true. Inspector Gadget no doubt speaks for many frontline officers who suffer this lunacy. Can there be any clearer example of a well resourced department spewing forth any old crap in an attempt to justify its dubious existence? If anyone needed evidence that police ‘managers’ are not fit for purpose and have warped priorities that do not match our priorities then consider this… With the amount of taxpayers’ money spent on policing being cut, why are senior police ranks talking about cutting the number of police officers when the psychologically damaged idiots who dreamed up this directive will continue to be employed? 3. Not A Sheep on Awfully Still Isn’t It? I know I said I wouldn’t be back until tomorrow, but Joe Bastadi’s latest post on his Accuweather column shows he got it right again with his forecast of a let up in the icy conditions between Christmas and New Year. 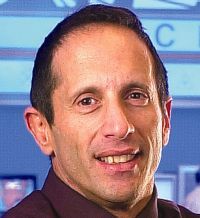 Bastardi continues on theme of deconstructing of the alarmism of those who believe human CO2 emissions are warming the planet – and who have unashamedly stated that all this ‘localised’ (China, US, Europe, even Australia…) extreme winter weather is evidence of global warming, after telling us the lack of extreme winter weather was… evidence of global warming. Winter is not over, though for the U.K. and Ireland, the coldest part (against the NORMALS) is. But look, folks, with low solar, natural oceanic cycles, and the wild card of my triple crown of cooling, volcanic activity, especially in high latitudes, my advice is to get ready for more of this in coming decades. And the CO2 people should open their eyes to other sides of the argument, since in 30 years or so when we come out of the cooling cycle, there may be room for your argument being pressed forth… but first we have to watch and see if the naturalists like me (that is my new nickname… nature boy) have a point. […] Well, why would a trace gas needed for life on the planet have more control over the planet than the interaction between the source of energy, and the system itself? While Bastardi is on the money the alarmists continue to chase the money. That underlines the difference in agenda. Hope you have all enjoyed a great Christmas. Blogging will resume tomorrow once the festivities at Mind Towers have wound down. Back soon. Wishing you the joy of Christmas and hoping this special time is blessed with peace, health and happiness for you, your family and loved ones. Britain is obtaining only a fraction of its electricity from renewable sources, just under 7 per cent in 2009-2010 [a dubious claim – AM]. 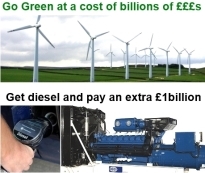 The wholesale price of that quantity of electricity would be approximately £1bn, but the Renewables Obligation, a complex subsidy paid to generators but drawn indirectly from bills, adds a further £1.4bn, more than doubling the cost to the British consumer. In its first three months, from July to September 2010, the Feed-in Tariff for microgeneration (guaranteed prices to support, among other things, solar photovoltaics [PV] and wind turbines up to a capacity of five megawatt) has produced roughly 0.005 per cent of UK annual demand, at a cost of £2.6m. This generous support has encouraged the construction of an installed capacity of microgenerators totalling 59 MW. To put that in perspective, peak load in Britain on a cold winter’s afternoon is nearly 59,000 MW. In private, the best-informed analysts now agree that Britain’s environmental policies have put the country on track to have the world’s most expensive electricity. This is mainly because our competitors are almost certain to choose cheaper routes to emissions reductions, such as natural gas, or to shun emissions reductions altogether. And it leaves us without the energy generation capability needed in a modern industrialised nation – particularly one led by idiots who think thousands of megawatts of electricity required for this ludicrously timed bit of spin will just ‘be there’ ready when we need it. Where does this folly originate? Unsurprisingly it comes from the leader of those Lib Dem opportunists, who denies there is a looming energy gap at all and that we just need to be more green. No, really. He actually believes this stuff. While safely away from the levers of power with their 18% or so in opinion polls it was easy to laugh off such naive stupidity. But now Clegg is sitting on Cameron’s knee and Huhne has been let loose at the Department of Energy and Climate Change, this insanity is being realised and unless it is stopped we are going to pay a huge amount in more ways than one. It takes a special kind of arrogance to treat an organisation with the undisguised contempt the BBC has shown to The Freedom Association. … a very, very right wing kind of sub-BNP, slightly posher version of the BNP. Anyone who knows anything about TFA will know it abhors discrimination of any kind and unconditionally opposes racism and the kind of identity politics engaged in by the BNP. If it didn’t then I would not support it. A number of people submitted complaints to the BBC, including myself. Somehow I just knew that despite the strength of the complaint, the BBC would dismiss it out of hand because one of its favourite overpaid sons had taken a swipe at something he considered to be ‘very, very right wing’. Such behaviour is grist to the BBC mill. Thank you for contacting us regarding remarks made by David Baddiel about Norris McWhirter and the Freedom Association on The Alan Davies Show on BBC Radio 5 Live broadcast on Saturday 18 December. On the show David Baddiel was discussing a television film he has recently made entitled ‘The Norris McWhirter Chronicles’. The film centres around a speech that Mr McWhirter made at David Baddiel’s school in the 1970s. The young Baddiel had expected a talk about the then popular TV programme ‘Record Breakers’ and was disappointed that Mr McWhirter’s speech was of a political nature. The comments made by David Baddiel were quite clearly his personal description of Mr McWhirter’s political allegiances. The Alan Davies Show is a live, light hearted, entertainment programme and in this context we are satisfied that no broadcasting guidelines were broken. So, personal descriptions of Norris McWhirter’s political allegiance that are factually incorrect and derogatory, and speculation by Alan Davies and Baddiel about whether McWhirter was a ‘Brown shirt’ (the morons meant an Oswald Mosely ‘Black shirt’, but hey, BBC ignorance has no bounds) are no problem. That is always the way isn’t it? What they are essentially saying is that any BBC employee or interviewee can give a ‘personal description’ of ‘political allegiances’ irrespective of the facts, and they may do so with impunity. This being the case, why did the BBC apologise to the Muslim Council of Britain and pay them £30,000 of taxpayers’ money in compensation for remarks made by Charles Moore on Question Time? Why was Mr Moore not permitted to articulate a ‘personal description’ of the behaviour of the MCB? Why does the BBC readily acknowledge ‘injury to feelings’ when it comes to some minority groups or organisations of ‘the Left’, but is evidently of the view that the family and friends of Norris McWhirter and members of The Freedom Association do not live with bread like them; do not feel want, taste grief, or need friends. Quelle surprise. Bias from the BBC. It seems in this world the only way to ensure you are afforded respect is if you rub shoulders with homicidal maniacs who tend to resort to violence at any perceived insult. In the face of anger from the Muslim Council of Britain the BBC doles out our money and issues fulsome and humble apologies for any offence caused. In the face of anger from decent, law abiding and polite members of The Freedom Association the BBC sticks up two fingers and tells them to go hang. And we pay handsomely, under pain of fine or imprisonment, for these sycophantic self loathing quislings. It’s enough to make one sick.